She will be participating in the same fair Andy Warhol was part of. Riveting paintings have made the artists behind them rise to popularity, so much so that the two are almost always linked. Leonardo da Vinci, a polymath of the Renaissance, is revered for his artistic artworks, the most famous one being the Mona Lisa. The same goes for Vincent van Gogh, whose name has reached across the globe owing to his compelling masterpieces, such as The Starry Night. Just as many artists experiment with their chosen mediums—thus establishing a new genre and becoming icons of it—Filipino artist Sal Ponce Enrile is breaking the conventions of her art. The legislator-turned-painter is making waves in the international art scene. Currently, she’s preparing a gutsy display of expressionistic masterpieces for the 41st year of the world’s largest fine art trade show, the Artexpo New York, which will take place from April 4 to 7. “This collection of work is a reflection or a glimpse of my transition as an artist, which may also be applied by anyone entering unknown territory,” the young artist says. Last year, Sal ventured to new territory by leaving public office for art. She had served as the representative of 1st District of Cagayan for two terms during the 14th and 16th Congress. Sal shares, “I am truly grateful that I got this opportunity early on in my nascent career as an artist. I am humbled by this great honor as a Filipina, at this stage in my career to have my work displayed at the Artexpo.” She will be participating in the same fair Andy Warhol, Robert Rauschenberg, Keith Haring, and Leroy Neiman have been part of before. 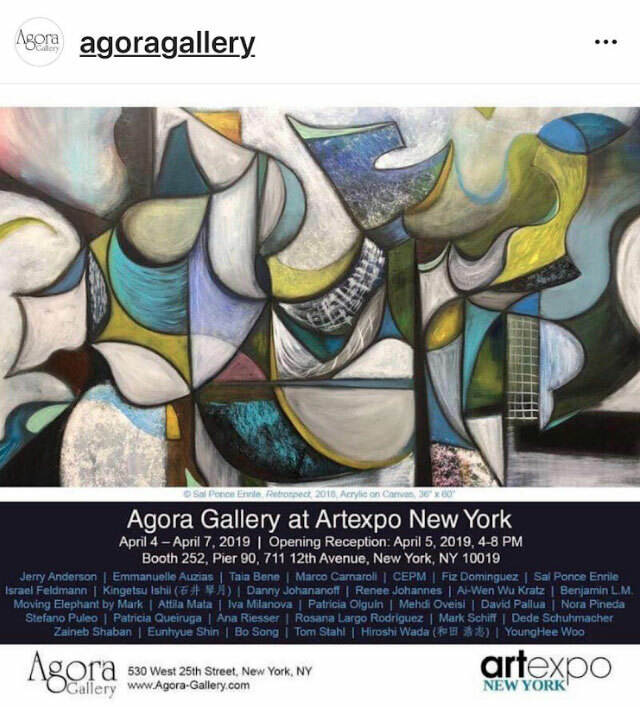 Her painting Retrospect was chosen by Agora Gallery in New York to be her featured work for the prestigious exhibit. It shows soft gray strokes—akin to scribbles on a chalkboard—that seem to hover on a dark background. With more energetic brushstrokes on the brighter colors, the work evokes the idea of controlled chaos. Her paintings Delirious, Dream, Perplexed, and Glade, which were created as she forayed into abstract art, will also be exhibited along with the works of over 400 other innovative artists, galleries, and publishers from around the world. The artworks extend from prints, paintings, drawings, sculpture, photography, ceramics, giclée, lithographs, to glassworks, to name a few. This year, the expo is hosting more than 35,000 avid art enthusiasts and qualified trade buyers, including gallery owners and managers, art dealers, interior designers, architects, corporate art buyers, and art and framing retailers. Given this, Sal believes that she would carry not only her name in New York but also the identity of Filipinos. “It will serve as an inspiration to many great Filipino talents to keep honing their skills. It is never too late to follow your passion,” she says. Last November, her work was displayed in Marbella, Spain by the UK-based DragonArt.io, a modern legacy platform focused on combining art and technology. She was a featured artist along with musicians-turned-visual artists Brian Travers of UB40 and John Illsley of Dire Straits. Here's the good news: Local art fans can also view three of her paintings at the Art Circle Gallery, SM Megamall for its anniversary exhibition from March 31 to April 10. Proceeds from all her exhibits go to the charity she’s supporting. To view Sal's other works, follow her on Instagram and Facebook. This article is sponsored by FIRST SHOSHIN HOLDINGS.